The Lincoln is a gorgeous two-story home with a finished floor area of 1,906 square feet. This spacious plan has a total area of 2,912 square feet, which provides ample space to include a garage and a porch. Its first floor has a combined kitchen, dining, and family area, a separate living room, and a lavatory. The second floor has 4 bedrooms, including a spacious master bedroom. 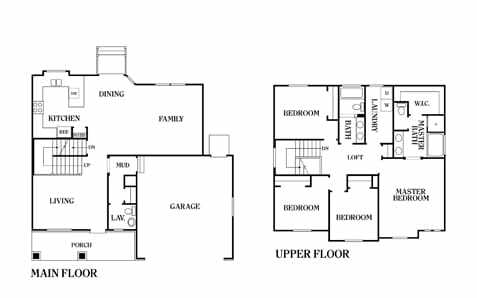 The house plan also has a full bath, a master bath with a walk-in closet, a loft, and a dedicated laundry area. Perry Homes Utah is a name you can count on when you want to finally get that dream home. Having been in the heritage home building industry for over 40 years, we take pride in building rambler and two-story homes that are both gorgeous and affordable. Our home models are especially crafted to suit the needs of American families of varying sizes, and the plans can be customized to fit different needs and preferences. Our clients enjoy a full range of customization options without needing to undergo a cumbersome process. Our design personnel will guide you in choosing the details of your house plan. We also offer financing options that will make it easier for you to buy your own home. Give us a call today at 801-264-8800 and find out more about how you can get your dream house with Perry Homes Utah.